The accreditation of course achievements obtained abroad has always been generously dealt with at the School of Business and Economics. Each module or course respectively at our partner universities abroad within the framework of the existing university agreements will be accredited once the advising Nürnberg professor confirms the equivalence of the course achievements obtained abroad. Course achievements at other universities can be accredited upon application (“freemover”), however in this case it is necessary to finalise a learning agreement in advance with the subject coordinator or module coordinator here. Learning Agreement to be completed. If you want to study abroad at a university which doesn’t have a partnership agreement with FAU, please check in advance with the respective subject coordinator that the level and content of the courses are such that they can be accredited. If this is not the case, there can be no accreditation. 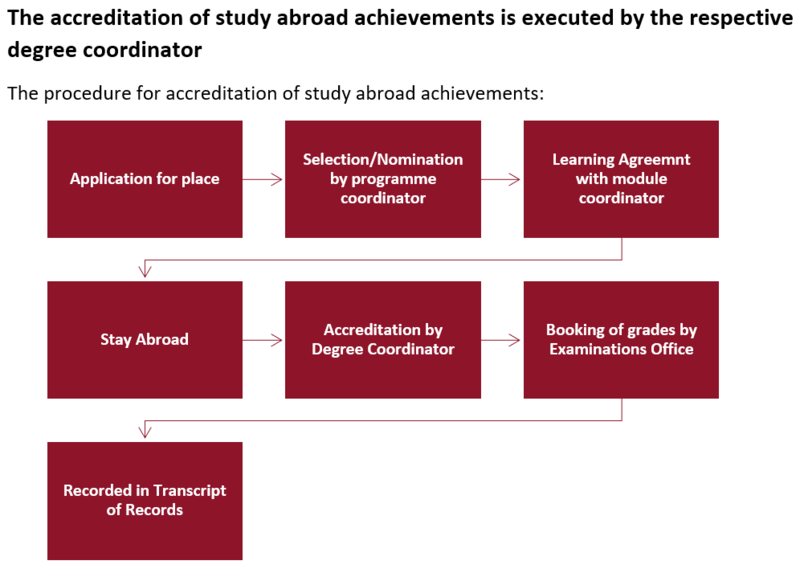 As of February 2010 the simplified procedure for transferring grades and accrediting the course achievements obtained abroad has been in effect. Once the coordinating Chair has concluded the Learning Agreements and the student has successfully passed the exams abroad, the student has, on their return,to take their Transcript of Records to their degree course coordinator, who will complete all of the grades transfer. The grade tables which are used here are determined by the responsible programme coordinator, and can be accessed in the International Relations Office, but will not be sent out electronically or the like. The tables take into account the longstanding experience of our professors in accordance with the recommendations of the Hochschulrektorenkonferenz (HRK), based on the “Modifizierten Bayrischen Formel” and country-specific features. The completed form BA/ MA must then be signed by our office (please bring a copy with you for this purpose), and finally, the form must be submitted to the Examinations Office so your achievements can be accredited. 1. The grade transfer is based solely on the “local grades” which are entered on the official Transcript of Records. 2. Further details in addition to the “local grade” such as ECTS-Grade, Grade Point Average, Grade Point, Class Performance Evaluation, or the like will not be taken into consideration in the grade transfer. 3. If grades are entered in the Transcript of Records both in % and in a different grade system, the %-grade counts. 4. Any recommendations given by the host universities abroad on grade transfers cannot be considered either. 5. The Examinations Board and the das International Office respectively (in consultation with the programme coordinators) reserve the right to check the grade transfer tables at regular intervals and, if appropriate, to alter these. The grade transfer table held by the course coordinators which is in force on the day the application for grade transfer is submitted is decisive. 6. If you participate in an Erasmus programme in Europe, it is possible that your host university will grade you in accordance with the ECTS grade system (A-B-C-D-E-F). Should there be no other grade system recorded in your Transcript of Records, the grades will be transferred in line with ECTS-grades.